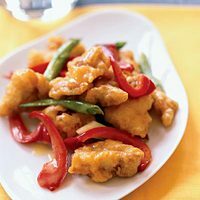 The Chicken Recipes Kitchen (The home of delicious chicken recipes) invites you to try Lemon Chicken recipe. Enjoy our collection of quick & easy recipes and learn how to make Lemon Chicken. Preheat the oven to 200 degrees . Set a rack on a baking sheet next to the stovetop. In a medium bowl, whisk together the lemon curd, vinegar and 1/2 teaspoon salt. Fill a large saucepan with enough oil to reach a depth of 2 inches and heat over medium-high heat until it registers 350 degrees ; on a deep-fry thermometer. In a medium bowl, whisk together 1 cup water, 3/4 cup flour, the cornstarch, baking powder and 1/2 teaspoon salt. In another medium bowl, toss the chicken with the remaining 2 tablespoons flour and a pinch of salt. Working in 3 batches, coat the chicken with the batter and, using tongs, add each piece to the hot oil. Fry until golden, about 5 minutes. Using a slotted spoon, transfer the fried chicken to the prepared rack and keep warm in the oven. Let the oil return to 350 degrees between batches and repeat with the remaining chicken. Add the bell pepper and scallions to the hot oil and fry until crisp-tender, about 2 minutes. Using a slotted spoon, transfer the vegetables to the lemon curd sauce. Arrange the chicken on a platter and spoon the sauce on top. Tip Use 1-inch cubes of firm tofu instead of the chicken.